When bees leave their old hive, they send out hundreds of scouts to find possible locations for the new hive. This quest for prime bee real estate quickly devolves into another battle between art-forms: specifically, bee dancing vs. bee singing. As scouts find attractive sites for the new hive, they begin to perform what's known as a waggle dance. You can see an example of such a dance in the video up top. The dance is meant to attract other bees to join the scout, and the better the potential site is, the longer the bee will dance. 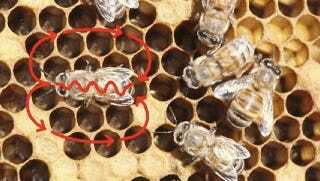 It's a fairly simple method of group decision-making - too simple for the bees, in fact, as Cornell researcher Tom Seeley has discovered. Seeley set up a bunch of good and bad hive sites in a controlled setting, and then he released a bunch of scout bees to explore the area. The scouts that found decent locations began to perform their waggle dance, but those bees that found really good sites went a step further. They began "singing" a succession of abrasive, high-pitched sounds meant to unsettle the other scouts and get them to stop dancing. If that didn't get the message across, the scouts would start physically butting up against them, just to really make things clear. Since the perceived value of a site is pretty much directly tied to how long a bee dances over it, any scouts that stopped dancing were effectively conceding that their spot wasn't that great. This allowed the scouts who had found the really good spots to force the swarm into a fast decision. It's not the nicest thing to do, I suppose, but it definitely has its advantages - such quick decisions limit the amount of time the bees spend homeless and exposed to the elements. Via New Scientist. Video by Bienentanz Gesellschaft für Kommunikation mbH. Image via University of Nebraska - Lincoln.